On a photo - black platy biotite. Biotite (magnesia-ferrous mica) is adopted on the last name of the French physicist Biota. 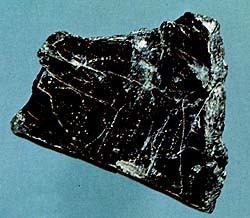 It most widespread from micas is aluminum silicate. Glance (glitter, glare) mother-of-pear nacreous, golden-yellow has on an efflorescent surface, gold color and metalloid brilliance (in common parlance is a "cat-like gold"). Transparent. Colors: dark-green, darkly-brown, black. A line is white. Cleavage very perfect absolute. Elastic, flexible and fissions on thin leaves. Crystals are rare. Usually presented lamellar tabular aggregates. Be found everywhere as rockforming mineral. Biotite is a black or dark green mineral of the mica group, found in igneous and metamorphic rocks. Composition: hydrous magnesium iron potassium aluminium silicate. Formula: K(Mg,Fe)3(Al,Fe)Si3O10(OH)2. Crystal structure: monoclinic. Tablitchatymi is presented by pseudohexagonal crystals, and also, more frequent, elastic plates, deprived crystallography outlines, in addition, by wrong scales and their aggregates. Colouring is rose-brown, very light greenish or (in-bulk) black. Cleavage perfect absolute along bottom base, brilliance of glassy, on-the-spot cleavage of mother-of-pear nacreous. On correlation of basic chemical elements in composition a mineral select varieties: lepidomelane, siderophyllite, annite, meroksene et al. Black, darkly-brown, dark-green(depending on maintenance of iron); defecate biotite (bronze color) is sometimes named cat-like gold (Bauerite). Chemical composition (chemistry, compound). Very changeable; oxide of potassium (K2O) 4,5 - 8,5%, oxide of magnesium (MgO) 0,3 - 28%, protoxide of iron (FeO) 2,8 - 27,5%, oxide of iron (Fе2О3) of 0,3- 20,5%, oxide of aluminium (Al2O3) 9,5 - 31,5%, oxide of silicon (SiO2) 33 - 45%, water (H2O) 6 - 11,5%; admixtures: oxydic compounds of titan, natrium sodium, lithium, manganese, barium, strontium, caesium. In a chemical relation biotite is "omnivorous": there are numerous chemical elements in him. Varieties: meroksene (Greek. "meroks" - alien) is normal, poor iron biotite; lepidomelane (Greek. "legiadose" is a scale, "melas" - black); siderophyllite (Greek. 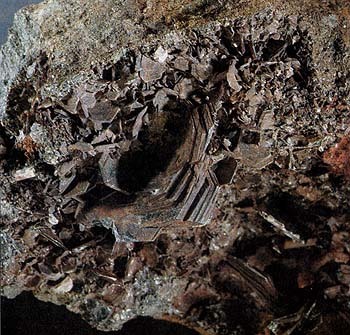 "sider" is iron, "fillos" is a sheet) - very rich in iron and almost not containing magnesium biotite. Rubellan - brownish- or brick-red variety of biotite. Be found in effusive rocks. 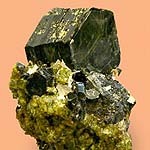 A glauconite is a green hydromica, shallow rifle-green scales. A product of transformation of biotite is in salt water. Widespread in siltages of marine origin. Fracture, break. A mineral is elastic, flexible, fissions on leaves. Form of crystals. Stolbchatye, pseudohexagonal, plate tablet lamellar. Crystalline structure. Stratified lattice. Class of symmetry. Prismatic - 2/m. Cleavage. Very perfect absolute on a base (plane of cleavage) (001), noperfect absolute on lateral verges and verges of prism. Aggregates. Dense, fissile, scaly. Added the action of sulphuric acid. In flame of candle melt fuse easily on edges. Under the action of atmospheric factors changes easily, transformed in green chlorites; can also pass to muscovite, becoming colourless or almost colourless. Hardly melt fuse in grey or black glass (depending on maintenance of iron). A behavior is in acids. In the concentrated sulphuric acid decomposes fully. 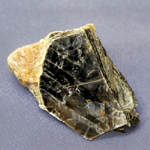 Biotite - widely widespread mineral of almost all of types of rocks; it be found in intrusion, irruption, effusive, basic sediments and metamorphic terms. 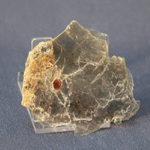 Very beautiful crystals are in pegmatites of Russia, Greenland, Brazil and Scandinavia. On the Scandinavian peninsula, in Norway, biotite of enormous sizes is found, by an area to 7 м2. In Italy the magnificent copies of crystals are presented in geode among the products of eruptions of Vesuvius, and also in Val'-di-fassa (province of Trento). In Baveno (province of Verbaniya) found out siderophyllite, met also on Alaska. Not having an industrial wideuse, biotite is saved by an enormous scientific value, allowing to judge about terms formations of rocks which it be found century .